R&D Systems is supporting neuroscience researchers by awarding ten travel grants of $1,000 each to attend the Society for Neuroscience Annual Meeting in New Orleans. The application window opens May 14 and closes July 31, 2012. R&D Systems is proud to promote neuroscience discoveries through travel sponsorship. R&D Systems is pleased to announce that it will award travel grants for researchers to attend the Society for Neuroscience 42nd Annual Meeting (Neuroscience 2012). The biotech company invites neuroscience researchers to apply for funding by visiting their website at: http://www.RnDSystems.com/NeuroTravel. Ten travel grants of $1,000 will be awarded. 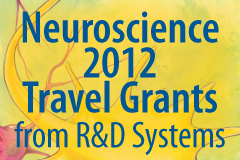 Neuroscience researchers planning to attend Neuroscience 2012 can apply for travel funding online between May 14 and July 31, 2012. The online application process is short and simple. Award recipients will be will be determined via a random drawing and announced August 31, 2012. Richard Krzyzek PhD, the Chief Scientific Officer at R&D Systems said, “R&D Systems is proud to promote neuroscience discoveries through travel sponsorship." This year’s Society for Neuroscience Annual Meeting, the premium conference for the neuroscience research community, will be held in New Orleans, Louisiana, USA (October 13 - 17). R&D Systems representatives will be attending the meeting and welcome enquiries on all neuroscience-related subjects. The company offers a broad range of high quality reagents for studying all areas of neurobiology, from neural stem cells to neurodegenerative disease. These include over 12,000 high performance antibodies, and the most referenced collection of bioactive proteins and immunoassays in the industry. Primary rat and mouse cortical stem cells are also available, as well as specialized media supplements and kits for the expansion, differentiation, and identification of neural stem cells. In addition, R&D Systems offers a wide selection of multiplex assays for the simultaneous detection of multiple analytes using different detection platforms.